Another year, another NeoCon—the annual design expo that showcases the innovation, creativity, and reimagination of how we will live and work. NeoCon 2017 boasted a higher attendance than last year—by over 7 percent—and according to Byron Morton, vice president of leasing for the Merchandise Mart Properties, this was a growth both in terms of registered attendance and the uniqueness of its attendees, as nearly 20 percent of the attendees were corporate end users. These numbers aren’t surprising; has any other space changed as much as the workplace in the past five years? This year’s colors waxed largely neutral in shades of ash, taupe, beige, and light sepia, and large block patterns took precedence over the detailed textiles of yesteryear. But nuance is everything: Wolf-Gordon’s Infinite Neutral, for instance, created a fabric that appeared gray but was spangled with nearly 30 shades of bold color in its warp and weft to create depth, and DesignTex’s Acoustic Drapery collection takes textiles even further by making it acoustic-friendly—promising to let light in and keep sound out. While displays of customizable desks for the workspace were predictably plenty, so were their insistence on concealing levers, widgets, and wires in order give furniture an organic appearance despite tech-savvy designs. Herman Miller’s height adjustable desk “Live OS” (created in partnership with designer Yves Behar) and Knoll’s “Universal Height-Adjustable Table” both were customizable, wooden desks smart enough to collect user data to remember preferences and sense movement. This extended beyond the desk as well: the Vitra Pacific chair by Barber & Ogersby, for example, automatically adjusts to the sitter’s weight and position with very minimal manual adjustment. 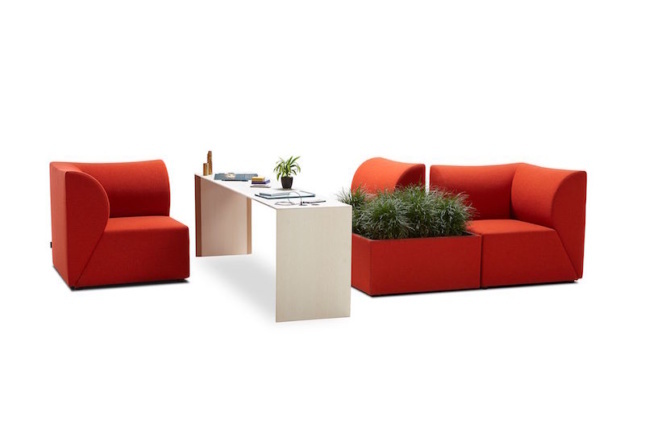 Many brands at Neocon continued to straddle the lines between the personal and the professional, collaborative and private, indoor and outdoor. The most explicit trend this year was reversal: Returning toward privacy and controlling the collaborative, open workspace by offering solutions to create seclusion. This, among other things, created an industry-wide pivot back to the phone booth: sound-muffling booths by Jabbrrbox and Framery were two examples of spaces designed to carve privacy in the noisy, open workspace. A hyperawareness of the speed of innovation to come was also central—from apps that control movement and send haptic buzzes to the user like Herman Miller’s Live OS, to DIRTT’s mixed-reality goggles featuring a custom-designed 3-D program that helps designers and architects envision partially-virtual interior spaces. 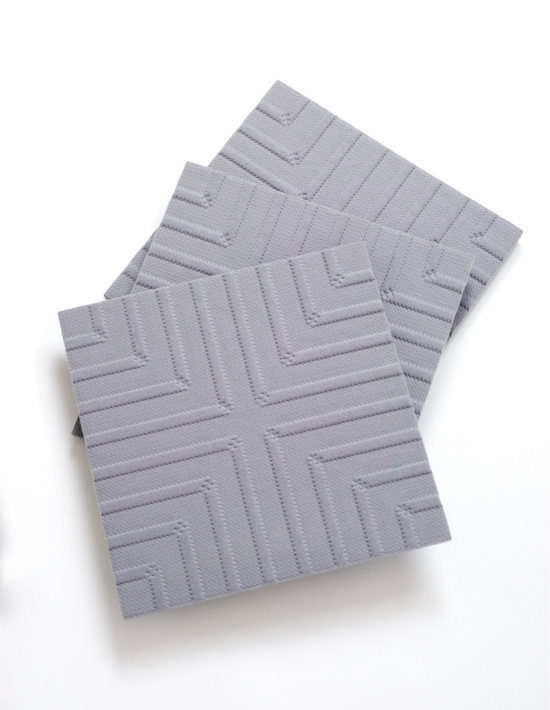 Six classic KnollTextiles patterns are impressed onto an ultra-thin tile, with each tile wrapped in 100 percent polyester. The tiles slide onto a Z-clip rail system, which offers a consistent architectural base for creating a tiled wall. Tiles are available in 16 colors, including warm and cool gray, as well as more bold, bright colors. Different levels of impression add dimension and texture to the tiles turning walls into sculptural surfaces. The Universal Height-Adjustable Screen can be easily affixed to a work surface or table, allowing employees the freedom to position themselves in sitting or standing configurations. Users can change their work setting by pulling up for privacy or pushing down for collaboration. Screens come in acoustic, tackable PET felt and opaque acrylic in a variety of colors. Koleksiyon collaborated with HOK and Studio Kairos to develop its new, flexible collection. Although the HOK pieces will debut later this year, Studio Kairos’s Poema sofa design for alternative workplace settings was a standout. The seating’s low height and worktop elements replace standard-height chairs and tables, creating a more space for meetings and creative teamwork sessions and collaborations. 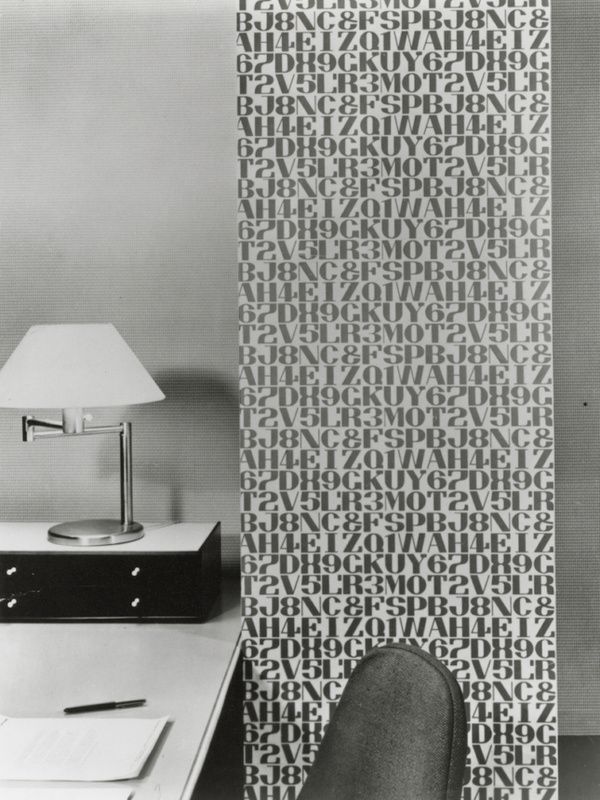 Maharam will reintroduce two iconic Alexander Girard designs—originally wall coverings—that will now be available as window covering applications. This geometrically patterned drapery underwent an industrial silk screen process in order to be reimagined as a “burnout drapery”— a fabric with dissolved fibers that give the entire material a semi-transparent effect. The Live OS sit/stand desk includes an app and dashboard to offer data-based insights in the workplace. 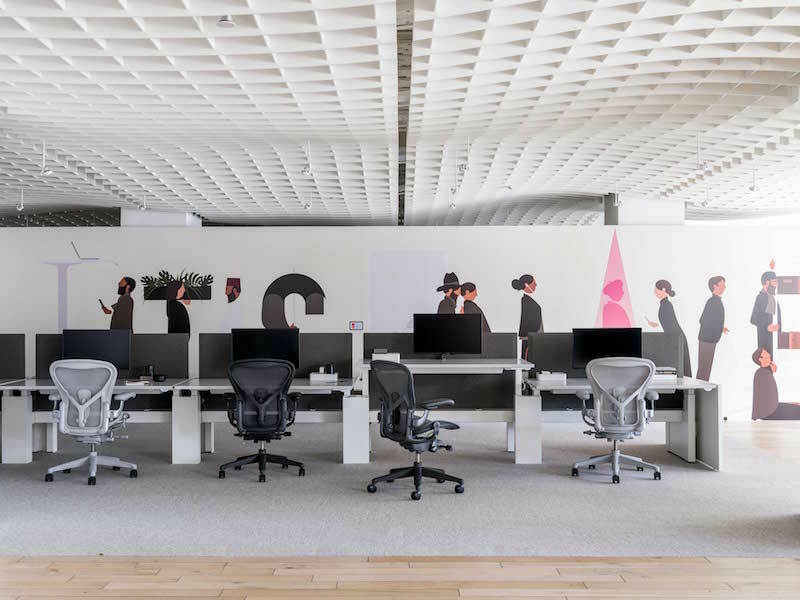 With the launch of Live OS, Herman Miller extends its traditional product offering to include this subscription-based service. Live OS will connect Herman Miller furnishings, including sit-to-stand and fixed height desks. 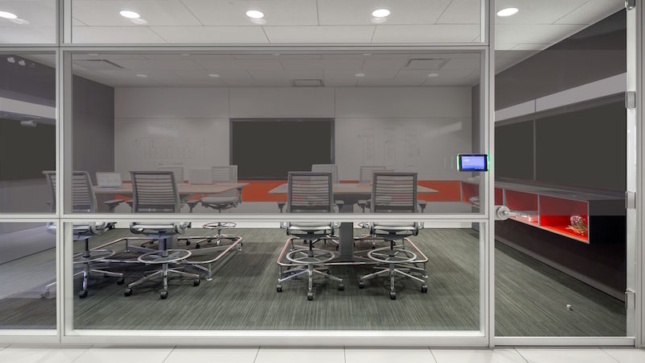 Either when first installed, or retrofitted later, Live desks are equipped with sensors that are continuously connected to the cloud using a secure cellular network. The sit-to-stand desk remembers preferred postures. If an individual chooses to receive reminders, the desk control will light up and vibrate, reminding them to switch positions. QuickStand can sit on any desktop and the height-adjustable work surface arrives ready to use. 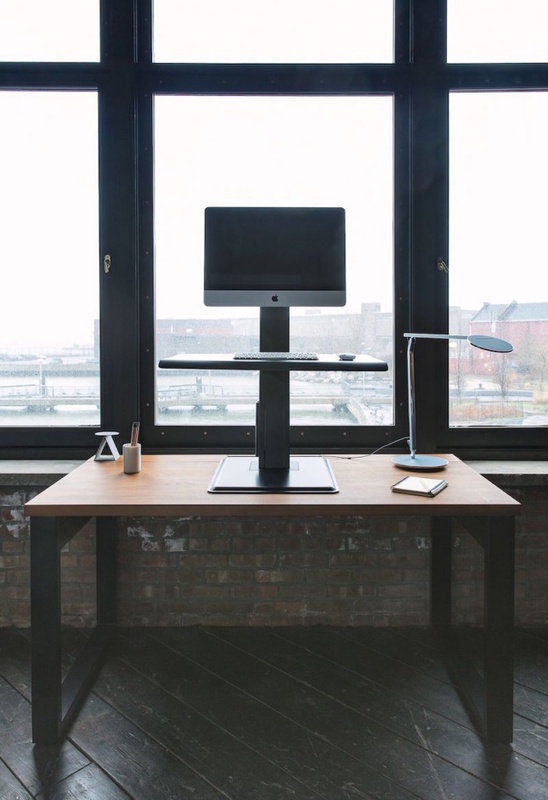 QuickStand Eco features a self-locking mechanism and is designed to accommodate a variety of heights and can support single or dual monitors up to 35 pounds in weight. Carnegie is introducing three new textile panels that boast sound-absorbing capabilities. New 3-D panel options are also available in several shapes, including the classic Waveline and Hex as well as Diamond and Square shapes. 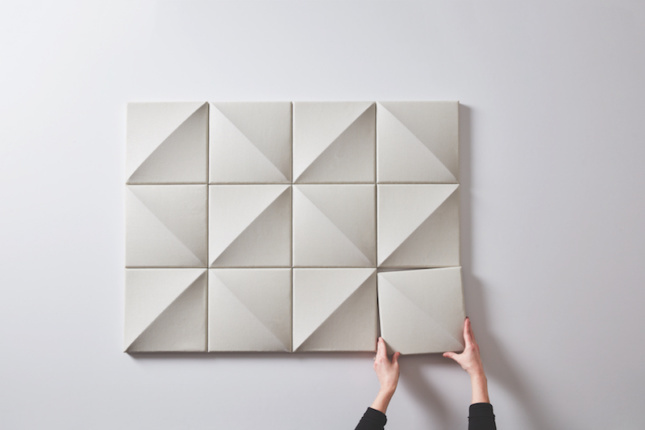 These can be used alongside existing shapes to create dimensional wall or ceiling installations. Casper™ Cloaking Technology by Designtex is an architectural film for glass walls that obscures digital screens to outside view. It acts as a smart shield to ensure data privacy. A passerby will see nothing but black screens as they go by a conference room full of them—whether in use or not. 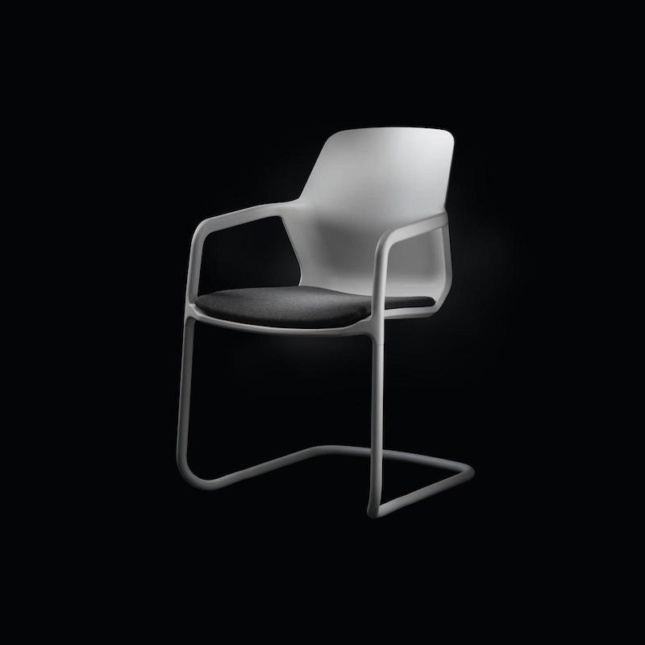 Wilkhahn’s cantilever chair has a monolithic look—the chair’s lines, volume, and defined surfaces form a shape that integrates the armrests with a tubular steel frame.